Another SSBD successful event. 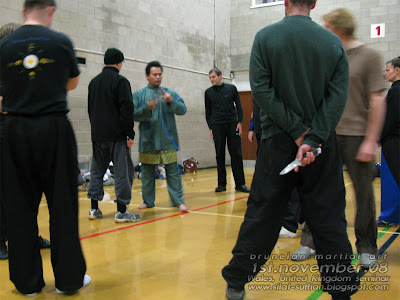 The 6th, and the last of 6 seminar scheduled in Wales, United Kingdom for 2008. 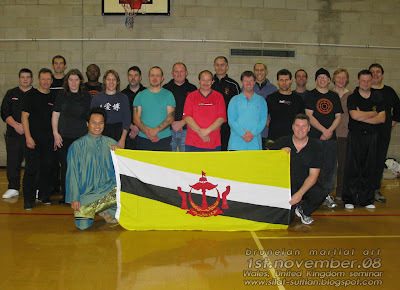 The workshop was hosted and organized by Goshinkwai Total Body Defense's Chief Instructor - Sensei Alun Williams on the 1st November 2008 at Risca, Newport Gwent, Wales, United Kingdom. It lasted 4 hours. 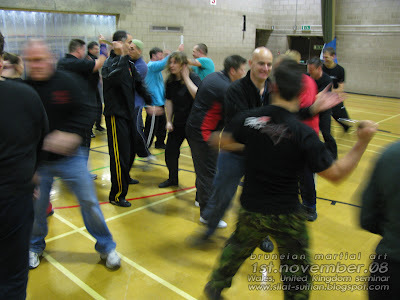 The workshop covered aspects of unarmed blade defence, counters and recounters, blade disarms and take downs. I would like to express foremost my appreciation to Sensei Alun Williams and Total Body Defense, Frank Ellul and the boys from Somerset, Lee Wilson and Olley from Cambridge, Jon O'neil and Kathleen from Ireland, Kie Brooks for coming down for his visit from Hong Kong, Deon and Tony from Bristol, and friends coming down from London (back row - far right and forth from right in picture), the instructors from Goshinkwai who never misses to attend the seminar, for their openness to accept and invite me to instruct a workshop for them - not many martial arts practitioners have thier kind of humility, my highest respects for them. To those helping me in the drills and demos. To Charlie of taking the pictures. My sincere apologies if I miss anyone, please correct me if there are any mistakes. 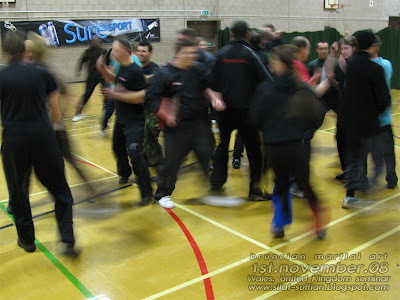 The year has gone so fast, it felt that it was only a few weeks ago that we did the 1st seminar for 2008. Thank you again everyone for the friendship and constant support for SSBD and myself. Seminars for 2009 has already been confirmed, please check links on the right of this page. 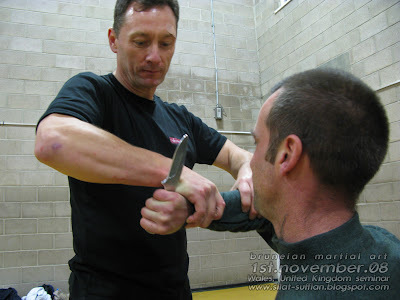 The seminar focuses on the mechanics of unarmed defence against a commited knife attack. 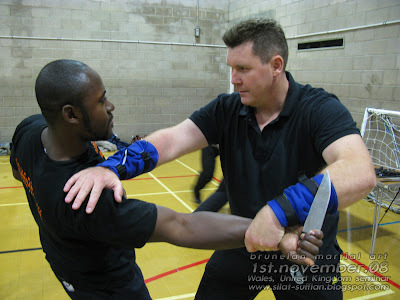 The the instruction started with familiarizing the participant with the basic angles of incoming attacks and how to read intention and body mechanics. 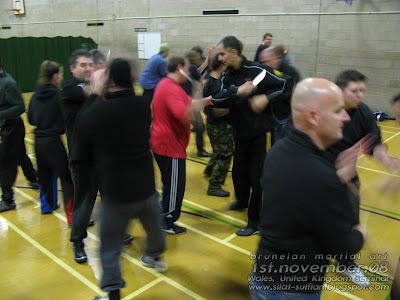 In the 1st half of the seminar the participants were instructed on how to flow from the basics of various angles of commited knife attacks, knife interception, defence counters and recounters, flowing from one to the other. 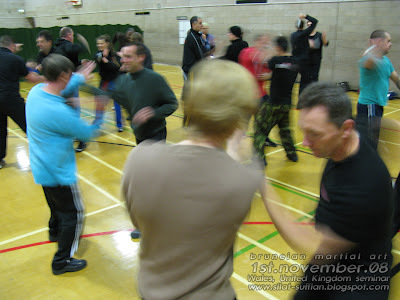 In the 2nd half of the seminar, the participants were instructed body mechanics, disarms, counters for disarms and re-counters without stopping thier fundamental blade movemenents. 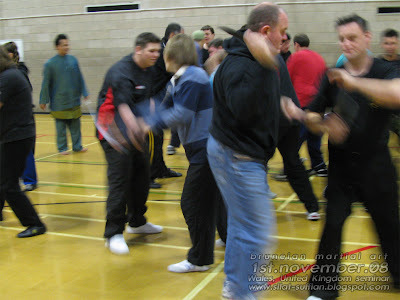 The Participants were also instructed empty-hands self defence and silat take down methods. 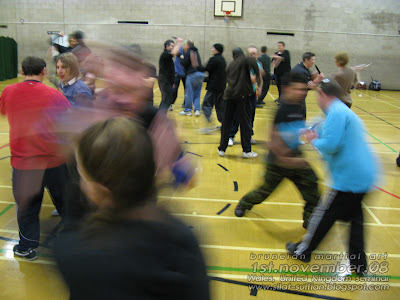 To avoid the participants from over thinking on every movement, everyone was kept on thier toes as new movements was introduces every 10 minutes. The secret to conditioning reflex is - the less you think with your brain, the more your body remembers. 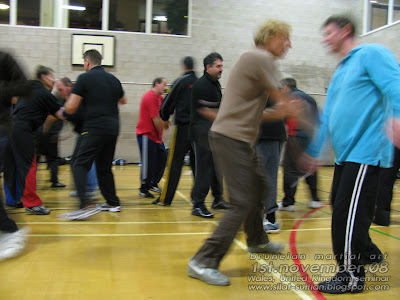 The seminar was not aimed to teach techniques but principles so that practitioners from varying arts that attended the seminar could benefit from the instruction. 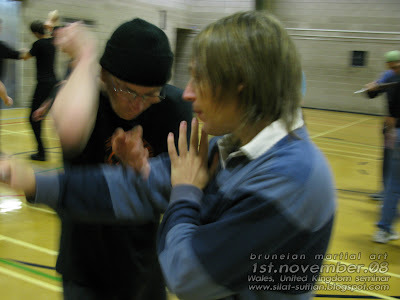 The basic drills and principles taught are not to replace sparring or reality, but merely giving the practitioners options on what to do when an unexpected situation arises by conditioning basic reflexes against basic counters. 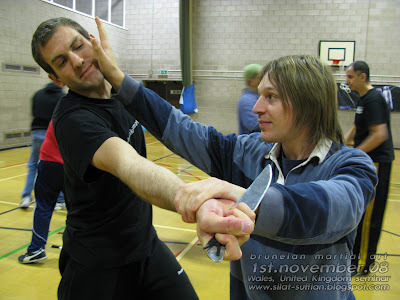 Drilling simple movements against common attacks and counters against a knife defender with different situations, a "would be" victim could raise his chances in surviving the situation. 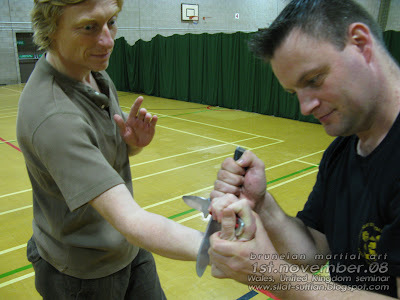 The seminar was not aimed to make you invincible, but to prepare yourselves incase you do have to face the worst senario of a knife attack. 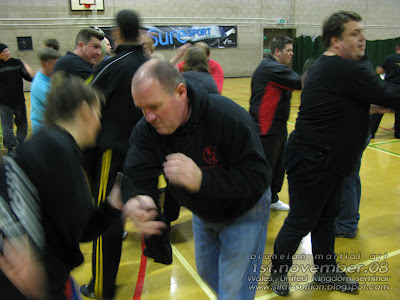 5th Dan, Chief Instructor, Alun William's - Total Body Defence Goshinkwai system is one of the most well known in South Wales and is rapidly growing within the United Kingdom, he and his group of talented instructors have been featured in several martial arts magazines, as well as radio and TV coverage. I have the honor of calling these group of incredible martial artists and individuals my friends. 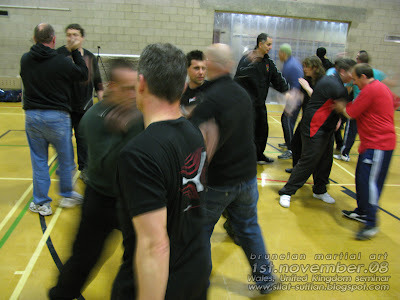 If you live anywhere near where they teach, experience what they have to offer in no nonsense self defense. If you live too far away to accept direct instructions from them, their DVD is available to purchase on their website. You will not be disappointed. I personally recommend it. 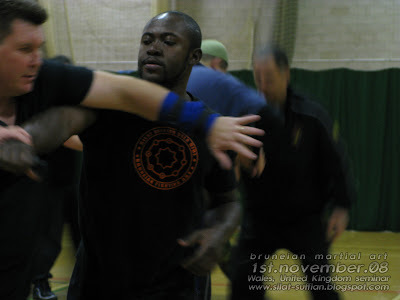 The Goshinkwai Total Body Defence DVD won the DVD of the Year Award - The Fighting Spirit Award at the SENI Event on 2008.